You are here: Home / Blog / Faith & Family / Proud Father of a Child Superstar! Proud Father of a Child Superstar! Okay, so I’m sitting in a high school gymnasium wire-framing a website with about a hundred or so actors all in costume waiting for their scene to be called out over the loudspeaker. It’s a pretty cool experience to say the least. Spencer has had a blast this morning getting to know the rest of the cast and the crew. I just had a guy come over and introduce himself as Spencer’s movie dad, we talked for a little while, really nice guy. Just as he walked away one of the ladies sitting near us got up and asked for a photo with him, at first I thought it was a little weird but then I learned that he was actually a star on a television show that Donna and I used to watch all the time. My vision is really starting to get worse. It only took Donna two seconds to whip out her phone and pull up IMDB (Internet Movie Database) and identify him as sure enough, one of the stars, and then things all started coming into focus for us, this is the real deal. The entire city of Farmington is currently being overtaken by movie people shooting on location all around town. The experience so far has been pretty awesome. 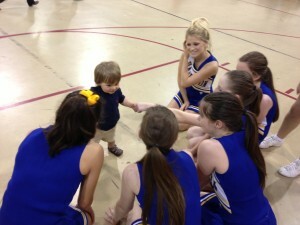 Spencer has been having a blast all morning getting to know everyone, especially the cheerleaders, who have also really taken up with him. I just looked up and noticed him waddling across the basketball court with about a half dozen or so cheerleaders step by step with him as he was grinning from ear to ear. I was totally embarrassed for him when his mom yanked him up so he could take his nap. How embarrassing. The entire room just fell silent when they yelled “rolling” because they are filming about 400ft outside the door. This is freaking awesome!! !